There are a lot of conditions that can affect battles and general gameplay, like different types of movesets, in-game time and weather effects. Here are a quick overview of the most important global conditions to be aware of on your adventure. Moves can be classified according to the kind of damage they deal when used. Physical moves are damage-dealing moves whose effectiveness is determined by the Attack stat of the user and the Defense stat of the target. Special moves are damage-dealing moves whose effectiveness is determined by the Special Attack stat of the user and the Special Defense stat of the target. Status moves are moves that do not deal direct damage, but may inflict status conditions or create weather effects capable to do so. Status moves can also be used to increase or decrease the stats of the target Pokémon. Contact moves are moves that cause the user to physically touch the target. When making contact, the user may activate the opposing Pokémon's Ability or trigger the effect of an item. The majority of contact moves are physical, but a few special moves can make contact as well. Time is an important mechanic in the Pokémon games, as it affects the Evolution of certain species of Pokémon, such as Eevee, the duration of activities in Poké Pelago, and several other clock-based, in-game events. In Pokémon Sun and Moon, the way time works is different for each game. In Pokémon Sun, the clock will function as usual, using the time set in the player's Nintendo 3DS. In Pokémon Moon, however, the time is shifted by 12 hours, meaning that players will explore the Alola region at night when playing during the day and vice-versa. Certain Pokémon can only be caught during the day or at night. 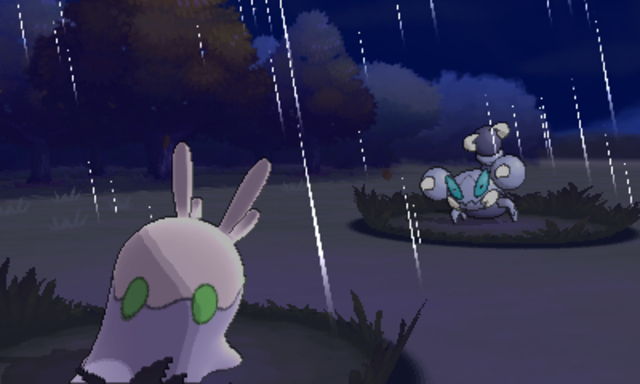 Weather effects are a set of mechanics in the Pokémon games that cause the battle environment to change. Some of them can be encountered naturally in the overworld while some others are created exclusively during battle. They can be temporary or last indefinitely. Weather effects will affect all Pokémon in the battlefield, often adjusting the power and accuracy of certain moves, dealing damage to specific Pokémon, triggering Abilities, and even changing the type of Castform and its trademark attack, Weather Ball. Boosts the power of Fire-type moves by 50% and halves the power of Water-type moves. It can be created using Sunny Day or activating Drought and it will last for five turns (eight turns if the Pokémon is holding a Heat Rock). It can also occur naturally in the overworld, in which case it will last until replaced. A variation known as extremely harsh sunlight is brought about by Desolate Land and completely nullifies damage-dealing Water-type moves. It will last for as long as the Pokémon that summoned it stays on the battlefield and its Ability is not suppressed. Harsh sunlight allows Solar Beam to be used instantly and activates the following Abilities: Chlorophyll, Dry Skin, Flower Gift, Forecast, Leaf Guard, and Solar Power. Boosts the power of Water-type moves by 50% and halves the power of Fire-type moves. It can be created using Rain Dance or activating Drizzle and it will last for five turns (eight turns if the Pokémon is holding a Damp Rock). It can also occur naturally in the overworld, in which case it will last until replaced. A variation known as heavy rain is brought about by Primordial Sea and completely nullifies damage-dealing Fire-type moves. It will last for as long as the Pokémon that summoned it stays on the battlefield and its Ability is not suppressed. Rain increases the accuracy of Thunder and Hurricane so that they will always hit their targets. It also activates the following Abilities: Dry Skin, Forecast, Hydration, Rain Dish, and Swift Swim. Damages each Pokémon at the end of each turn except Rock-, Ground-, or Steel-type Pokémon. It can be created using Sandstorm or activating Sand Stream and it will last for five turns (eight turns if the Pokémon is holding a Smooth Rock). It can also occur naturally in the overworld, in which case it will last until replaced. Sandstorm raises the Special Defense of all Rock-type Pokémon by 50% and activates the following Abilities: Sand Force, Sand Rush, and Sand Veil. Damages each Pokémon at the end of each turn except Ice-type Pokémon. It can be created using Hail or activating Snow Warning and it lasts for five turns (eight turns if the Pokémon is holding an Icy Rock). It can also occur naturally in the overworld, in which case it will last until replaced. Hail increases the accuracy of Hurricane so that it will always hit its target. It also activates the following Abilities: Forecast, Ice Body, and Snow Cloak. Halves the power of moves that are super effective against the Flying type. It can be created activating Delta Stream and it will last for as long as the Pokémon that summoned it stays on the battlefield and its Ability is not suppressed. Strong wind causes the following moves to fail when used: Sunny Day, Rain Dance, Sandstorm, and Hail. It also prevents the following Abilities from being activated: Drought, Drizzle, Sand Stream, and Snow Warning.